A massive fireball streaked across the sky above Cyprus this weekend, but it's nowhere near the biggest ever. A massive fireball caused the skies of Cyprus to turn as bright as day in the middle of the night this weekend, astonishing onlookers. But as big and beautiful as it was, it’s nowhere near as big as the five biggest meteor strikes of all time — and it’s a good reminder that our Earth is under constant onslaught from these potentially devastating space rocks. 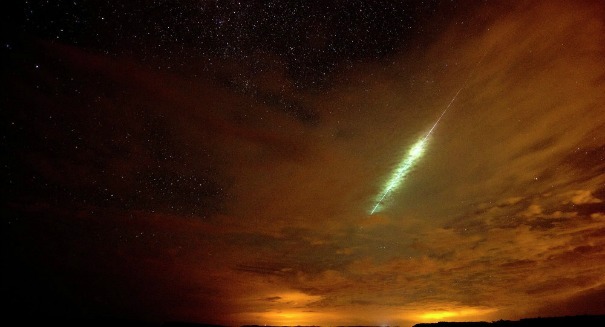 The huge fireball streaked through the skies over Cyprus in the early morning hours of Friday. It also caused a massive boom that shook the earth, although authorities don’t believe it struck the Earth and likely exploded up in the air. It certainly gave quite a shock to people in the Troodos mountain range, who reported seeing green-white lights at about 1 a.m. and then a huge explosion. While such meteors may seem rare, in actuality there are 30 meteorite impacts each year, we just don’t see most of them because 70 percent of our planet is covered in water, and we also only occupy a small percentage of land. The meteor called to mind the 2013 meteor that exploded over the Russian city of Chelyabinsk, which damaged buildings and injured 1,000 people. But even that was nowhere near the biggest strikes ever. 5. Manicouagan Crater. This crater is in Quebec, Canada and is believed to have come from an impact even about 215 million years ago. The crater formed what is Lake Manicouagan today, and it is considered one of the largest craters on earth at an astonishing 62 miles wide. 4. Woodleigh Crater. This impact event happened 364 million years ago in Western Australia. It is not exposed to the surface, so it is tough estimating its size, but it may be up to 75 miles in diameter. 3. Acraman Crater. This impact event happned 580 million years ago in South Australia, and it is now Lake Acraman. The diameter is about 56 miles. 2. Sudbury Basin. At 81 miles in diameter, it is one of the largest impact structures on earth. It is located in Ontario, Canada, and is believed to have happened 1.8 billion years ago. 1. Vredefort Crater. The big daddy of them all is the Vredefort Crater, which came from an impact even 2 billion years ago in South Africa. At a radius of 118 miles, it is the world’s largest known impact structure.